Want to learn how to go faster than a walk on your skis? 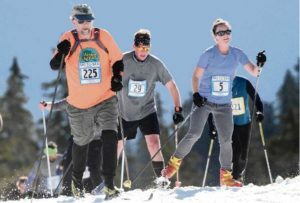 Member Neil Bransfield has 20 years of experience as a XC ski instructor and has volunteered to teach skate and classic cross country skiing for our members. Speaking of your own equipment, we believe rentals suitable for track skiing are available at both Backcountry Essentials and Yeagers.